Congratulations to Island RIBs apprentice Lewis Wilde who has been invited to become a Lloyds Register Foundation 100A1 Ambassador. The Lloyd’s Register Foundation is the global charity of the Lloyds Register. The Foundation officially launched its ambassador programme on 26th April 2017 with the initial appointment of thirty-five ambassadors, most of whom are leading figures of industry and academia. The role of the ambassadors is to promote the work of the Lloyd’s register foundation, which aims to enhance the safety of life and property and advance public education in these areas. As a 100A1 ambassador, Lewis may be invited to represent the foundation at events such as functions, exhibitions, talks and visits. His initial appointment is for three years. The name of the programme reflects the history of the organisation.in 1870 100A1 was introduced as the highest classification in the Lloyd’s register Rules and Regulations which lay down the standards for construction and maintenance of ships. The 100A1 classification is still used today. 100 signifies the ship is suitable for seagoing service, A means the ship is constructed or accepted into LR class and maintained in good condition, and 1 means the anchoring and mooring equipment is good and efficient. A very successful end to 2016 saw all of our winter build slots filled. Over the ‘quiet’ months we have expanded our workshops at the Kingston Works site in East Cowes and grown our laminating team to keep pace with demand. 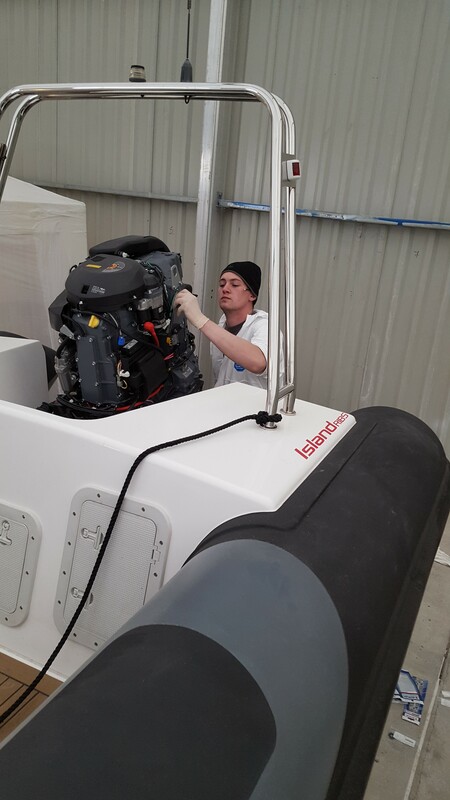 We have also welcomed a second apprentice boat builder to our team. All the winter hard work is paying off, with the first sea trial of the new season taking place successfully this weekend. Watch this space for news of more boat launches in the coming weeks! Island RIBs second year apprentice Lewis Wilde stars in this short film, commissioned bu the Lloyds Register Foundation, for their ‘Born To Engineer’ project. The film was shot in and around Island RIBs premises in East Cowes and contains plenty of footage of our RIBs in action. We are very pleased with the final edit and very grateful to DuckRabbit and the Lloyds Register Foundationn for choosing us to be the subject of their film. We will be exhibiting at the Southampton Boat Show 2016 from 16th to 25th September. You can find us in the marina on berth M537 with our 7.5m demonstrator, featured in this video. If you would like to book a sea trial, please contact us. Safety, durability and clarity of vision are the most important considerations when it comes to a RIB windscreen. The industry standard material used for windscreen manufacture is Acrylic. Acrylic is cheap and easy to shape, but although strong it cracks easily and will shatter explosively under sufficient impact. The alternative is polycarbonate: vastly stronger than acrylic and completely shatterproof. Racing car windscreens and bullet proof glass are manufactured from polycarbonate. In the 6mm thickness required for a RIB windscreen it becomes very difficult to heat shape into a compound curve which is needed to shed water properly from the screen. Polycarbonate windscreens are expensive largely due to the difficulties associated with shaping the material. At Island RIBs, we are constantly striving to improve upon every aspect of the design and manufacture of our RIBs. We keep as much of our manufacturing process in house as possible in order to control the quality of our product. We were determined to use the superior polycarbonate but unable to find cost-effective means of purchasing high-quality ready-made polycarbonate windscreens. Rather than settle for acrylic we developed the tooling, built the oven and devised the process required to heat form flat sheets of 6mm polycarbonate in our workshops. Manufacturing our windscreens in house keeps costs to a minimum, meaning that our customers benefit from a superior polycarbonate windscreen without paying a premium for it. Polycarbonate windscreens are now fitted as standard to all RIBs in our range. We would like to thank Bembridge Harbour for making the Island 7.5m their Boat of the Month for April. Our demonstrator is pictured here with their state of the art forklift. To read the full artcile click here. Sea trials of our new 7.5m demonstrator were completed successfully at the weekend. We headed out towards the Needles in blustery conditions that provided rain, snow and hail (seen here collecting on the console). The deep-V hull kept us comfortable and dry in the chop while we put our new RIB to the test, and we were certainly grateful for the protection from the weather afforded by the full height polycarbonate windscreen. We have some great fuel economy data to report, with the SuzukiDF200APX performing superbly to achieve 0.9 litres per nautical mile at a speed of 29kts. Please contact us if you would like to arrange a sea trial. We are advertising a small selection of second hand RIBs on our website. Please click here to have a look. If you would like us to advertise your RIB then please get in touch with the details. Here is a film of our latest 7.5m RIB taken in the Solent during the recent storm Abigail. The high winds and big seas provided the perfect conditions to put our new hull design to the test. We had the Suzuki ambassador Adam Brennan on board with us for a sea trial and are pleased to report that everyone stayed dry and comfortable throughout. Our 7.5m RIB has been certified as Recreational Craft Directive design category B offshore for a crew of up to 10. Category B is defined in the RCD as “Offshore: Designed for offshore voyages where conditions up to, and including Wind force 8 and significant wave heights up to, and including 4m may be experienced. “ It is the highest design category possible for a RIB and is evidence of the seaworthiness of the vessel.